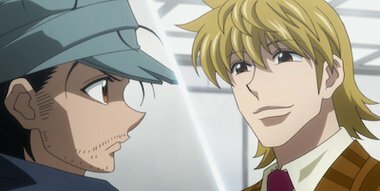 To ensure that Netero's last wish will be followed, Ging convinces the other members of the Zodiacs to procede with the election according to some rules defined by him. However, after the first round of voting, a winner is not decided and a second round begins. Meanwhile, Illumi informs Hisoka about Gon's condition and asks for his help to ensure Killua's safety as well, in a plan that somehow involves a fifth, yet unrevealed member of the Zoldyck siblings. Enfin un nouvel arc, l'ancien commençait à être un peu long ! Bon, ça commence fort, ce nouvel arc... Surtout la toute fin! Vivement le prochain épisode !